Now, a few months later in the just made available Catalyst 10.10 drivers and more specifically in their Release Notes we again have something similar. This time it is the announcement of support for the AMD HD3D Technology that was a part of the announcement of the new 6000-series of GPUs. And yet again we are really short on information, although we now have some announcements for S3D supported products that are becoming available or will soon be on the market. It seems that AMD loves to be “open” on initiatives, but not open on information about them. Their main partners, namely the companies iZ3D and DDD who are responsible for providing the software that is supposed to provide the auto-conversion of the 3D games to stereoscopic 3D format are also quite short on details. 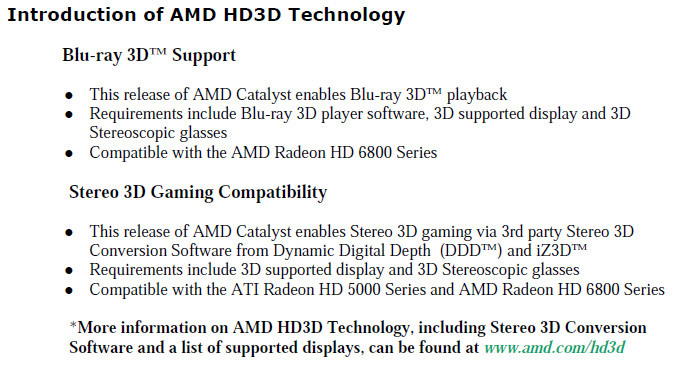 Both iZ3D and DDD are providing some automated checkers if you have a compatible system, with DDD saying that Radeon HD 5000 and 6000 series of GPUs are the only supporting the AMD HD3D technology as well as making some promotions to get the software they offer. It is interesting to note that DDD has released a new version of their TriDef 3D software finally adding support for DirectX 10 and DirectX 11 games, as well as support for AMD HD3D technology for 5000/6000 series of GPUs. 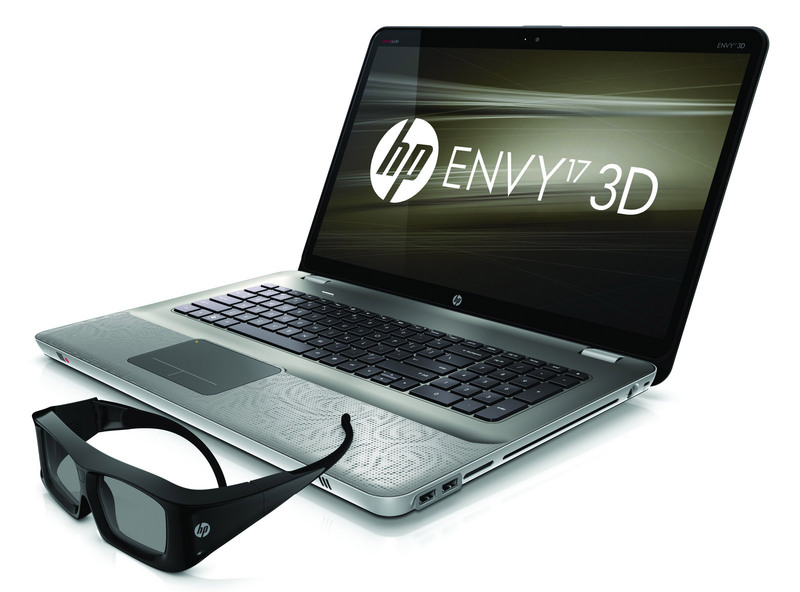 Checking out the new DDD TriDef Igntion reveals that there is now support for HDMI 1.4a for 3D HDTVs as well as HP’s Envy 17 3D laptop, but nothing more for a generic 120Hz LCD monitor for example. 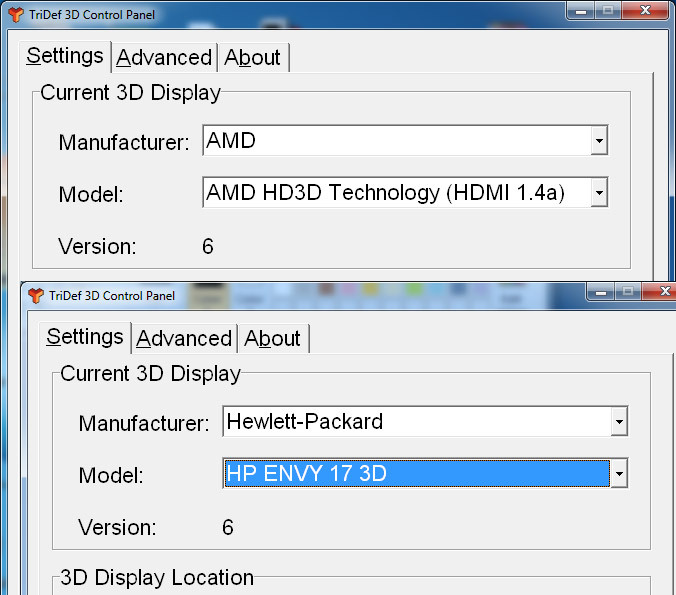 So if you have an ATI/AMD GPU and a 3D-capable HDTV you may download and try the HDMI 1.4a mode thanks ot the fact that DDD offers 14-day trial for their TriDef Ignition software and you are also welcome to report your findings here.